Our product range includes a wide range of copper nickel fastener. We At RIMCO OVERSEAS Are One Of The Leading Manufacturers, Exporter & Suppliers Of COPPER NICKEL FASTENER Of Superior Quality. These Are Available In Application Specific Designs As Per The Standard Quality Norms. Our Components Are Highly Durable And Appreciated For Their Strength And Toughness. As One Of The Prominent Manufacture And Supplier, We Are Offering COPPER NICKEL FASTENER To Valuable Clients. These Are Made Out Of High-Quality Raw Material Purchased From Certified Vendors. 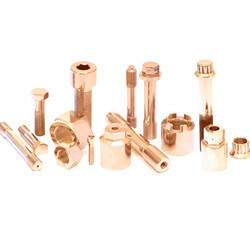 COPPER NICKEL FASTENER Are Designed By Skilled Engineers With Latest Technology. These Are Very Strong And Sturdy In Nature And Are Available In Different Sizes And Shapes At The Economic Prices.